Lastly, and an important part of the RV waste system that we are going to look at today, is the waste valve. It is important that you have a properly sealed and working valve on your waste tank to prevent leaks/drips while you are on the road. There are a few sizes of RV valves but the most common is 3”. This is usually what your RV will come with from the factory. Your valve will either be, handle operated or remote cable operated. A cable operated valve will protect your valves from damage due to placement in low and exposed areas. The flexible cable lets you mount in a direct push-pull position instead of the more difficult side pull. Valterra’s patented Cable Valve System converts hard to access valve handles to a simple push/pull placement. Cable handles can be positioned at the bottom of an RV sidewall, or within a control access compartment with bulkhead installation. It is important to check the seals on your valves a few times a year to ensure that they are not dried or cracked which may lead to leakage. If it looks like an issue may arise from a bad seal there are seal replacement kits available that save you from replacing the entire valve. If your valve and seal are still fine but you are having issues operating the valve, replacement handles and cables are available that may save you from a valve replacement also. Electric waste valves can also be used if the valve is in a spot where it may be difficult to operate or you are just looking for an even easier way to operate your valve. Motor kits are purchased to match the most common valve types and are added on to your existing valves. These kits come complete with the operating switch. This switch can be placed in a convenient location of your choice that will now make your valve a single push button operation. Depending on the plumbing coming out of your tank you can use a twist on valve or a slip fit valve. The twist on valve utilizes bayonet hooks. Most of your RV sewer hoses will also feature these same bayonets making them easy to attach when it is time for a tank flush. The bayonets make an easy connection for installing drip caps to prevent leakage when you are traveling. Sewer hoses are also available with the slip fit end if that is what valve you have available on the RV. Whether your valve is at a bad angle or it is to far away that makes your hook up difficult; there are many adapters, angles, extenders, couplers and swivel fittings that you are bound to find one for whatever your need may be. One thing that sure makes the tank dump process nice is a clear view extender or adapter so that you can see when the tank is all the way flushed and it is ok to disconnect. 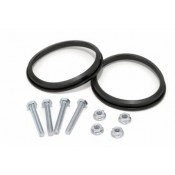 Most of your adapters and extenders will have built in rubber seals to make sure that you keep a leak free connection no matter what you are doing. The next thing in line of the sewer system is your sewer hose. Hoses come in various lengths and models. Your standard RV sewer hose will be 3”. While a hose is a hose, there are a few that stand out above the rest. RhinoFlex has been tested and is proven to be more durable then many of even the so called “heavy duty” hoses. The Rhinoflex can be stepped on, driven over and drug behind the RV and will not puncture while always returning to its original form. This eliminates the chances of someone walking by and stepping on your hose creating an unknown blockage for you. RhinoFlex also offers heavy duty swivel fittings in almost every shape, size and angle you can think of! Most hoses have bayonets built in to the end of the hose to make hook up to your twist on valve a breeze. Others may have slip fittings that require and extra adaptor before hook up. Whatever hose and valve you have, rest assured that Dyer’s carries all the options to make everything work out in the end! There are a few sewer hose accessories that can make life a bit easier (and cleaner sometimes). Sometimes storing the sewer hose between uses can the messiest part of the whole process. There are a few ways to solve this issue. Depending on the type of the RV, you may be able to store the sewer hose in your bumper. If your RV features a square tube 4” bumper there are caps available that give you easy access to the inside so that it can be used for storage. If you do not have a square tube bumper Valterra makes hose carriers that can be bolted in the storage compartments or to different locations on the frame or underside where room permits. Another hose accessory that is widely used is a sewer hose support or track. This keeps your sewer hose up off the ground (less likely to get stepped on now) while creating a slope all the way to the drain connection. This sloped path now aids in drainage. The last, and newest item that was recently introduced that can aid in the process, is the “SewiePig.” The "SewiePig" is designed to hold your sewer hose and fitting into the dump station connector to reduce risk of the hose end popping out of the tank and spewing sewage all over. The “SewiePig” is filled with water or sand and placed over top of your dump fitting to keep weight applied to the connection, thus reducing the risk of a pop-off. This can also clean up and add a little character to a normally unsightly area of your campground.